“you’re not strong enough to withstand the storm”. Today I want to introduce a new look, a bit rocker....Why "guns n' roses"? 'cause I'm a bit like that....sometimes sweet and lovely like a rose, sometimes bitter like a weapon!!!! I mean, I'm not the kind of woman who's always pleasant and kind, like a doll, without personality....I'm nice and good but depending on who I'm dealing with. Especially if you hurt me, intentionally and without reason, I can't forget....I'm not a woman who easily forgive. Moreover I believe in Karma and I'm sure one day who despised you, will regret it, most of time when it's too late. Some days ago I was watching a video on Youtube about love affairs and was so funny and true...."Men always come back", but in the wrong time, I mean when you found another best man or you realized he was only a big mistake. Such a cool outfit. 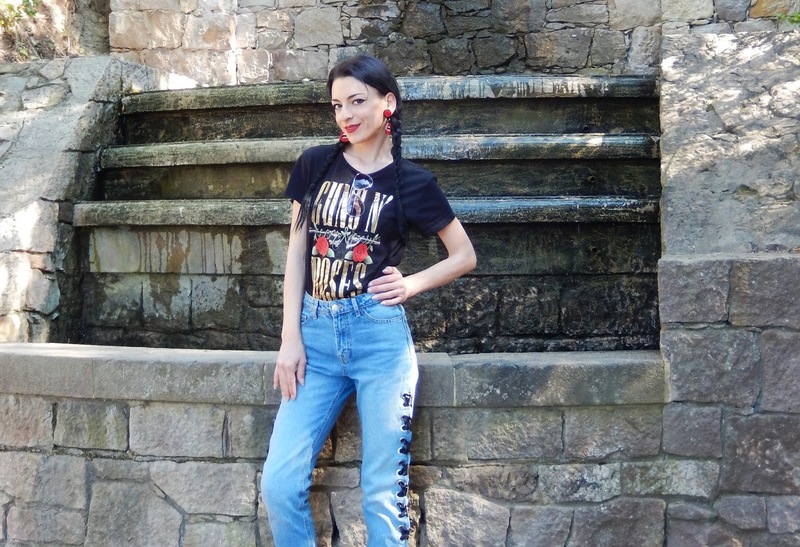 Love these lace-up jeans! Thanks dear, I love them too jejeje...are pretty cool!!! Thanks Nicola, are simply amazing....Have a nice day!!! Bellissimo look! Adoro lo stile glam-rock! Thanks Terry!! !I'm so glad you like it!!! Looking fabulous doll!! Love the jeans!! Thanks Rina!! !To be honest is not my style,I mean, the kind of style that best identify myself, but I like trying new looks and I enjoyed a lot!!!! Adoro questi jeans, tutto il look è strepitoso! adoro come hai attualizzato la tee dei guns!! Grazie mille!! !Mi piace sperimentare nuovi look e soprattutto dargli il mio tocco personale...un po' rock e un po' glam!!! Ahahahah...you've reason...I tried to express my badass side^^ Maybe for someone I'm proud but I prefer to say self-confident and aware of my value!!! me too jejeje!! !Have a nice weekend!!!! Che belli questi jeans. Il tocco rock che hai dato al look rende tutto più intrigante,mi piace! Grazie Cinzia!! !Diciamo che ho dato un tocco rock al mio stile, senza perdere quel tocco femminile che mi caratterizza!!! OMG! Shoes, jacket and earrings are so on point! Thanks dear,I'm so glad you like this outfit!!! I also believe in karma. This is a great edgy look. Thanks Izabela!! !My outfit is edgy as my personality jejeje!! !